Earlier this year we launched our extensive live music programme, which sees us host some of the city's most talented musicians. Playing a diverse range of music across all genres, the performers take to the stage to entertain visitors over the summer months in a series of free gigs. We are now delighted to announce our spectacular final line-up for September. On Saturday 1st September the two local gentlemen responsible for Leopold Square's music programme get a chance to step away from the mixing desk and onto their instruments. Playing a variety of jazz, soul and pop tunes, Ryan Taylor on vocals and Martin Robinson on saxophone is set to get the crowds moving. The Washboard Resonators are to bring a fresh energy to the sounds of the Roaring Twenties onwards on Sunday 2nd September. One of the UK's most in-demand session drummers, Phil Johnson, accompanied by renowned Sheffield saxophonist Martin Robinson, will be visiting Leopold Square on Saturday 8th September before Steel City Soul provide audiences to The Square with an afternoon of fantastic covers on Sunday 9th September ranging from Aretha Franklin, Michael Jackson and Stevie Wonder, to Bruno Mars, Beyoncé and beyond. This set list is sure to get the party started! On Saturday 15th September the Ryan Taylor Hammond Trio will be treating visitors to the venue to a fusion of jazz, blues, funk and soul, followed by Velocity Brown and the Hotrods who will bring a melodious end to the weekend with their mix of jive, swing, Rock 'n' Roll and R 'n' B on Sunday 16th September. Phil Johnson and Martin Robinson will be stepping back into the limelight to showcase their vocal and keyboard skills on Saturday 22nd September for the second time in September, before Ryan Taylor rounds up the weekend on Sunday 23rd September. Always leading a tight band from behind a wall of vintage keyboards, this gig is set to get visitors grooving. Finally, with a combination of sassy vocals and smooth jazz saxophone, Samantha Jade and Ryan Taylor will be bringing the beat to The Square for the final weekend of live music on Saturday 29th September, followed by Howling Ric and The Rocketeers who will bring Leopold Square's 2018 live music programme to an end on Sunday 30th September. Hailing from Leeds, this is one of the most authentic and slick Rock 'n' Roll bands in the UK. Frontman Ric is accompanied by a super tight band that look and sound straight out of the 50s rockin' scene. 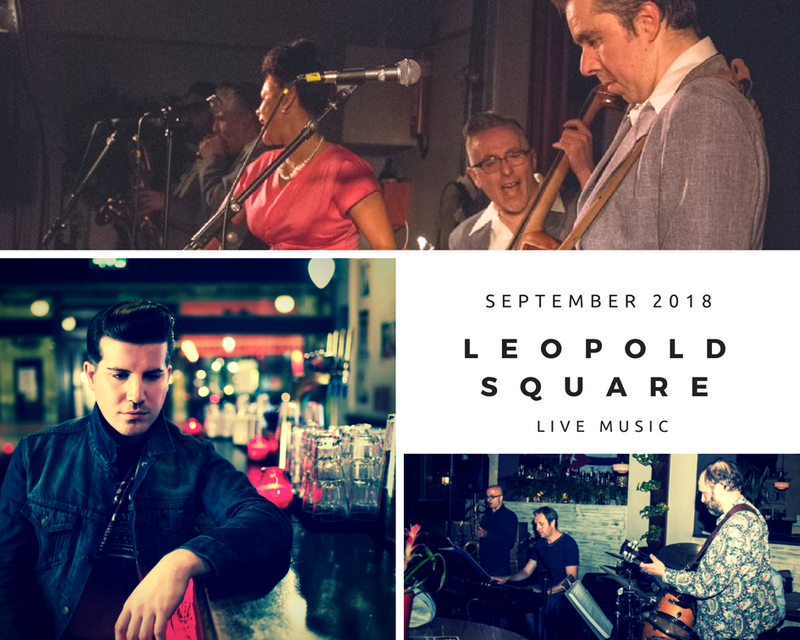 All live music at Leopold Square will take place between 2pm and 4.30pm on Saturday and Sundays. From York via Leeds College of Music and now a Sheffield resident, Samantha Jade steps up as a talent to watch. A swinging nu-vintage 6-piece band formed by guitarist Aaron Hook and all hailing from Leeds. Sheffield jazz/soul/funkateer Ryan is familiar face at Leopold Square! We're delighted to be bringing back our popular summer live music weekends and between May and September will be hosting a wide variety of fantastic musicians. We're inviting dance groups in the local area to be part of our inaugural World of Dance Festival, which is taking place on Saturday 29th June. We're opening up space for buskers! We're inviting Sheffield buskers to join in with our brand new Busk Stop initiative. Be the first to hear about events & promotions at Leopold Square.